If you’ve visited Beaver Lake in the last few weeks you may have seen an unusual structure by the shore. Made of wire, this is known as a Beaver Baffler (or Pond Leveller) and it’s designed to manage the beavers’ natural instinct to dam the water flowing from the lake into Beaver Creek. Everyone knows that beavers like to build dams and the family in Beaver Lake is no exception. Damming expands the area of the lake they call home to create more habitat for their favourite foods: willow and alder trees. Damming also makes the water deeper, which can prevent the lake they live in from completely freezing in winter. 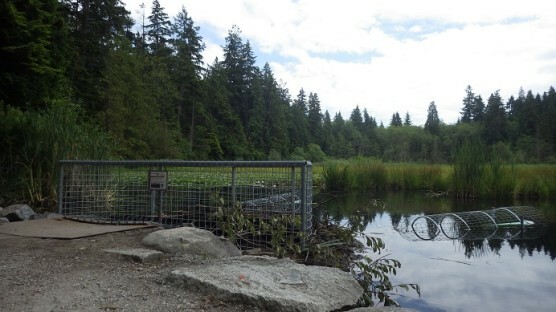 However, when the beavers in Stanley Park block the outflow from Beaver Lake, it stops vital water from flowing to Beaver Creek, which is a spawning stream for coho salmon and cutthroat trout – a ‘species of special concern’ in BC. This is bad news for both populations in the Park. The Beaver Baffler is cunningly designed to stop this from happening. The baffler is set up so the beaver can’t sense where the water outflow is, although they will be able to hear the flowing water. It’s this noise that stimulates the beavers to begin damming. Next time you visit the lake, look for a mud “wall” built up by the beavers against the wire fencing. They can no longer reach the lake outflow, and pipes beneath the water’s surface continue to direct water into Beaver Creek. The baffler will also reduce the amount of time Park staff must spend clearing away the beaver’s work. 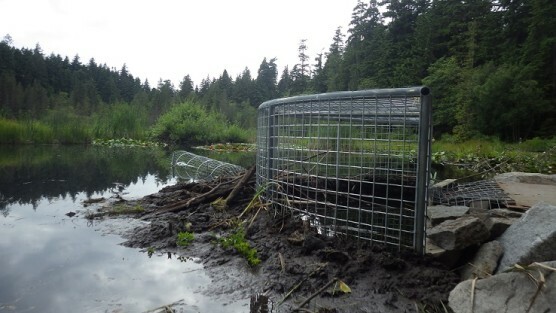 Until the baffler was installed, workers had to move the material that the beavers accumulated every day from the lake outflow weir. You can see this mountain of debris beside the trail at the head of Beaver Creek. The new baffler should only require maintenance once every couple of months. Although Stanley Park appears wild, it is a heavily managed area used by thousands of people each day. Leaving the beaver to dam the lake would flood paths, roads, firefighting infrastructure, and reduce flows into Beaver Creek. Interventions like the beaver baffler help find a balance between recreation, maintenance and biodiversity within this urban park.